Supercomputer.io is the first technical conference for Parallella, to be held May 30, 2015 in Tokyo, Japan. You can participate even if you’re not in Tokyo. Parallella owners around the world will connect their boards via the Internet to create the most efficient supercomputer on the planet. Resin.io has built a special micro-SD-card image (using Docker) so adding your Parallella to the mix is relatively quick. This article includes detailed steps plus a few gotchas. Through Stanford Folding@home, computer owners around the world are using excess CPU cycles to search for cures for diseases like Alzheimer’s, Huntington’s, and Parkinson’s. The SETI@home project uses computers around the world to download and analyze radio telescope data to help with the search for extraterrestrial intelligence. The benefits are clear. Let’s get started. Parallella board. You can buy one for about $100 at these retailers. Ethernet connection to the Internet. 4 GB (or larger) micro-SD card. This procedure is has been tested on Mac OS X Yosemite (10.10.3). Linux instructions are probably similar. Something that tripped me up until I learned more: A Parallella configured for Supercomputer.io will run headless. There will be no HDMI output. When my HDMI monitor showed No Signal, I thought that I had broken something. No worries. This is just a headless system. I don’t know if that will change. Download the Resin.io image from the Supercomputer.io site. Resin.io has created a special SD-card image (using Docker) for this project. As you can see below, I stored mine in a directory called ~/Downloads/Parallella$. drwxr-xr-x   3 rth  staff         102 May 26 10:53 .
drwx---r-x+ 86 rth  staff        2924 May 26 11:00 .. Burning the SD card took about sixteen minutes (once I got the procedure right, as described below). Suggestion: Start the burn process, make sure it’s progressing, and then go work on something else. A watched pot never boils. Insert your SD card into your Mac’s SD card reader, and use the Mac OS X diskutil list command to determine the designation of the SD card. If you use portable hard drives with your primary machine, the SD card designation could change from time to time, so it’s important to perform this step each time you burn an SD card. From this diskutil report, we can see that we want to burn the SD image to /dev/disk2. The other device is the hard drive for my primary machine. Burning the wrong device will destroy data. Change into the directory where you downloaded the resin.io image. Use the the dd command to copy the resin.io image to the SD card. Gotcha alert: The first time I attempted to burn the image, I used a block size of 64k (bs=64k) for the dd operation. Big mistake on my part because the write operation took almost four hours. On my second attempt, I used a 1 megabyte block size (bs=1m) and the write operation finished in a speedy 16 minutes. So, learn from my pain and use bs=1m. bs=1m specifies the block size used for the destination file. 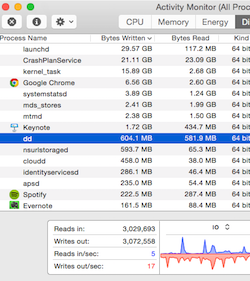 1 megabyte worked well on my machine. The new image will be called boot-parall as shown in the diagram. Depending on your particular image, your list of files may be the same as mine. 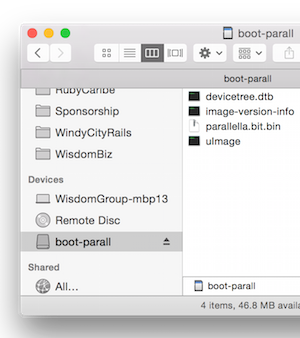 Once the micro-SD card has been burned, eject it from the Mac and insert it into the Parallella. Then apply power to the Parallella. As mentioned above, a Parallella configured this way will run headless, without HDMI output. So, how do you know if the Resin.io image is working? First, get a network scanner and use it to locate your Parallella on your local area network. I use an iPad app called Fing, but any good network scanner will do. Your Parallella will appear as parallella-hdmi-resin, along with its corresponding IP and MAC addresses. After you have successfully connected your Parallella to your LAN and the Internet, visit http://supercomputer.io/#/devices/ from a computer other than your Parallella (because the Parallella is headless). This page will tell you when your Parallella has connected to the Supercomputer.io mothership. To do this, you will need the media access control (MAC) address (also known as the hardware address) for your Parallella’s network interface. I used my network scanning tool, Fing, to find the MAC address for the Parallella. You should be able to do the same with your network scanning tool. Enter your Parallella’s MAC address in the field on the form, and click search to determine whether your device has connected. Your first connection attempt might not be successful. It takes awhile for the first connection to happen because the Parallella might need to download software updates first. I’m not sure what’s next for Supercomputer.io and Parallella. I would imagine that Status = idle will be replaced by something more interesting, and images processed will eventually be greater than zero. Consider a version of the Resin.io image with HDMI support. Like many in the Parallella community, I’m willing to share CPU cycles for the greater good. And I want to see what’s running on my Parallella, too. Add more metrics to the Supercomputer.io site. It’s nice to see the number of cores that have connected to Supercomputer.io. How about a map showing where the different Parallella devices are located? How about a dashboard that shows the number of cores currently in use? Hats off to the Parallella and Resin.io teams. Looking forward to more!